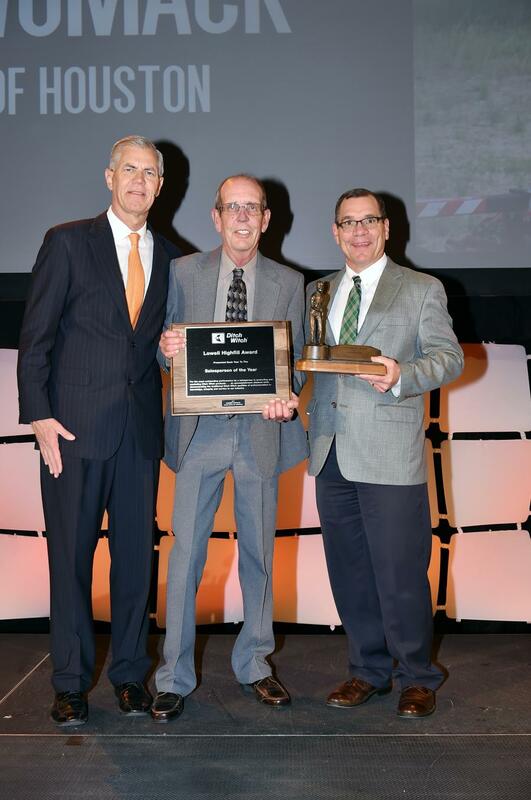 Ditch Witch recognized Robbin Womack of Ditch Witch of Houston with the 2017 Lowell Highfill Award – the organization’s most prestigious award for salespeople worldwide. Ditch Witch, a Charles Machine Works Company, recognized Robbin Womack of Ditch Witch of Houston with the 2017 Lowell Highfill Award – the organization's most prestigious award for salespeople worldwide. This award is presented annually to the top individual salesperson in the global Ditch Witch organization for his/her superior product knowledge and performance in promoting and marketing Ditch Witch products, jobsite solutions and services. Robbin began his career with the Ditch Witch of Houston dealership as a service manager in 1977. In his role, Robbin demonstrated a keen aptitude for direct customer interaction, which later expanded his talents into the parts department. After mastering almost every role one can play in a dealership, Robbin shifted into a sales position, and found he truly is a salesman at heart. Robbin is dedicated to building strong customer relationships and makes it a point to solve each customer's unique challenges. Whether it is changing beacon frequencies, adjusting chain tension, or troubleshooting parts for a trencher, he can usually handle the issue in one phone call. Ditch Witch of Houston is a family-owned dealership and has been providing underground construction service and support to the greater Houston-area for more than 40 years.